The three different editions of the Rendez-Vous Sonatina Large, the latest masterpiece issued from the Grande Maison's Metiers Rares "Rare Handcrafts" workshop, express each a stage of romantic feelings: seduction, romance, and love. Each one is released as a limited edition of eight pieces. To create these three limited editions, the Manufacture called on all of its most iconic forms of expertise, giving its watchmakers and Metiers Rares "Rare Handcrafts" artisans free rein to work their art. The latest addition to the Grande Maison's ladies' line, the pink gold Rendez-Vous Sonatina Large incorporates complications intended for incorrigible dreamers. Adjusted using the crown at 2 o'clock, a star indicates a future rendezvous with a delicate chiming sound. Could it symbolise the next meeting with one's beloved? Like a soft whisper, this reminder of a rendezvous is complemented by another complication, the day/night indication. 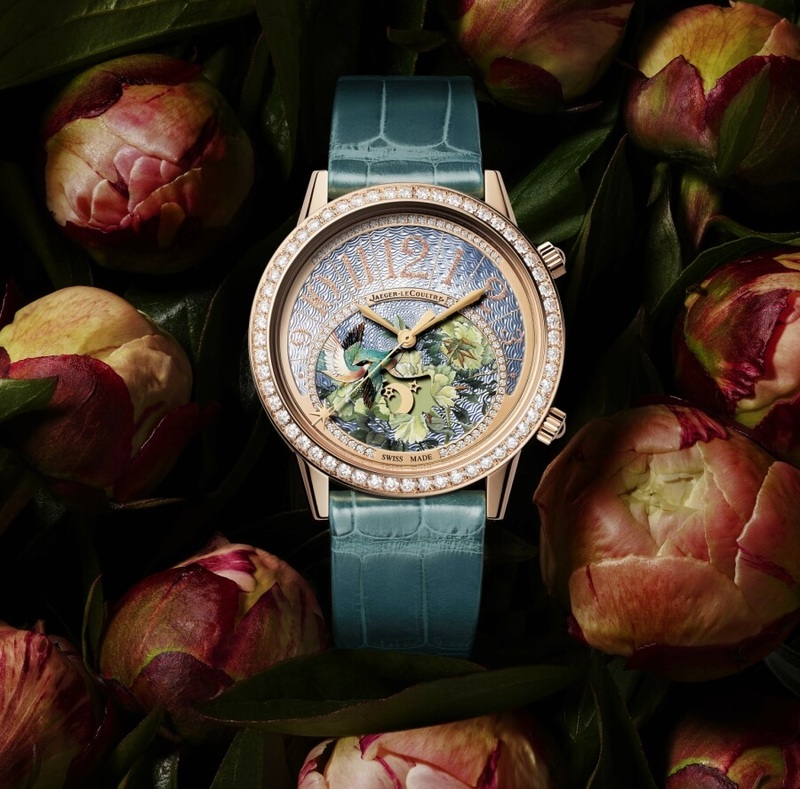 Housed at 6 o'clock in an aperture shaped like the flowers painted on the dial, the sun and moon take turns to perform a never-ending dance that evokes romantic reverie by day and by night. These typically feminine complications are characteristic of the Jaeger-LeCoultre 735 Calibre with automatic winding and are the perfect accompaniment to this generously sized 38.2 mm diameter Rendez-Vous model. The ingenuity of Jaeger-LeCoultre's watchmakers sits alongside the incredibly delicate artistry of the Metiers Rares "Rare Handcrafts" artisans. These pieces call on no fewer than three crafts: guillochage, painting on mother-of-pearl, and gem-setting. The mother-of-pearl dial is decorated by hand with a guilloche motif that stretches across its entire surface, before being coated in a slightly tinted layer of paint to give it a graceful gleam. Then, for the first time, the Manufacture's artisans have produced a miniature painting by hand on the mother-of-pearl. The results are supremely subtle, with all the details appearing truer than life. Some parts of the painting, such as the birds, have been covered with a layer of clear lacquer to add an impression of depth and to play with the material. Born of artistic inspiration renewed with the artisan's every brushstroke, each of the Metiers Rares "Rare Handcrafts" dials features a miniature work of art with its own personality. Each dial is therefore unique, despite belonging to the same series of eight pieces. The artist's handwork elicits endless admiration. Meanwhile, the master gem-setter has enhanced each piece with precious stones. The bezel is adorned with brilliant-cut diamonds that bring out the poetic creation on the dial. A line of these eternal gemstones runs above the iconic Rendez-Vous collection numerals on the flange to echo the string of stones that delicately surround the dial's central painting. To complete the decoration of this true watchmaking treasure, the gem-setter has also inserted diamonds into each side of the case. This thoughtful addition gives prominence to dreams from every angle. Each painting adorning these pieces is an original Jaeger-LeCoultre creation. The first stage of romance is embodied by the Rendez-Vous Sonatina "Seduction". Two swallows soaring over a lavender field embody this moment, a time of discovery and heightened emotions as lovers get to know one another, a theme often central to major film productions. Symbolising freedom and happiness, the birds appear to be performing a romantic ballet as they glide gracefully across a guilloche mother-of-pearl sky. The mother-of-pearl is dressed in twilit shades of blue and purple. The birds' every detail is painted with painstaking care, showcasing the artist's spellbinding talent of recreating the feathers of outstretched wings. A flower-shaped aperture housing the day/night indicator emerges from the heart of the deep lavender-blue plants, as if to provide a window on the rapid passing of time experienced by those falling in love. After seduction comes romance, a time when the heart is filled with the image of the beloved. 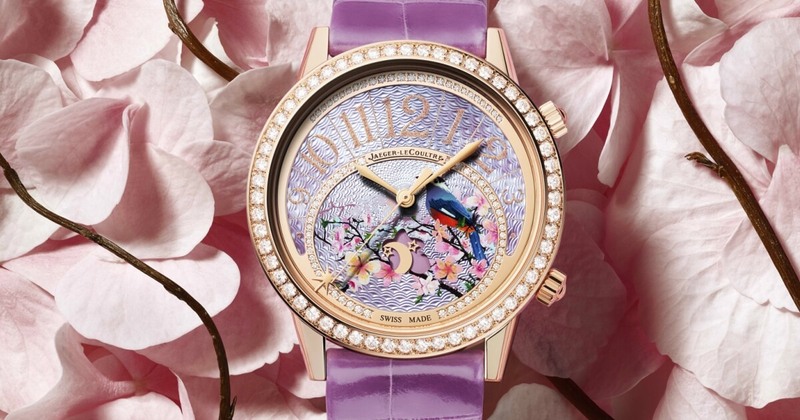 The Rendezvous Sonatina "Romance" depicts this state of endless reverie with a kingfisher perched on the branch of a blossoming cherry tree. A symbol of peace and prosperity with its blue and orange plumage, the kingfisher seems to forget the passing of time. Associated with life's important moments, such as romantic encounters, the blossoming cherry tree is magnificently recreated in graduated shades of pink and white. 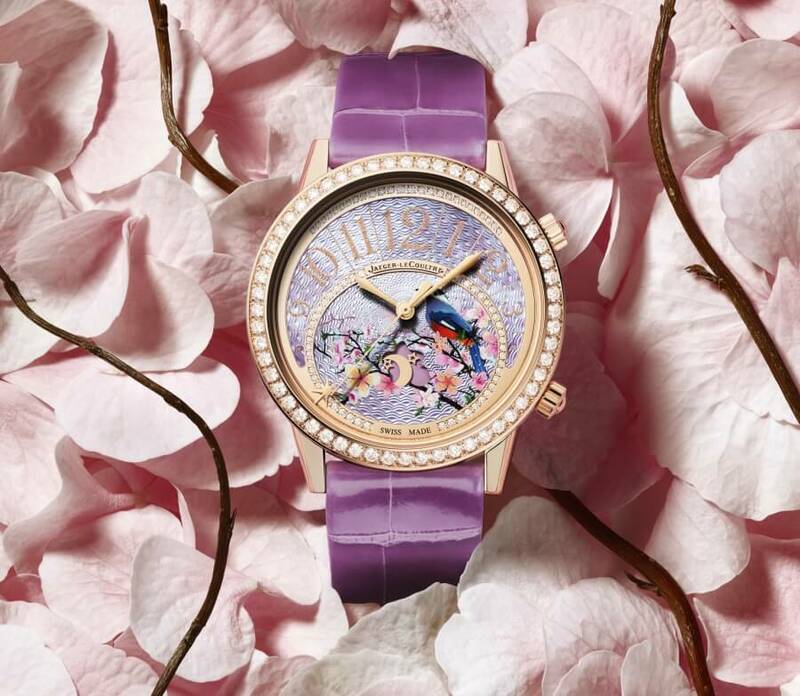 Delicate pink paint on the guilloche mother-of-pearl further enhances the intense colours of the petals. 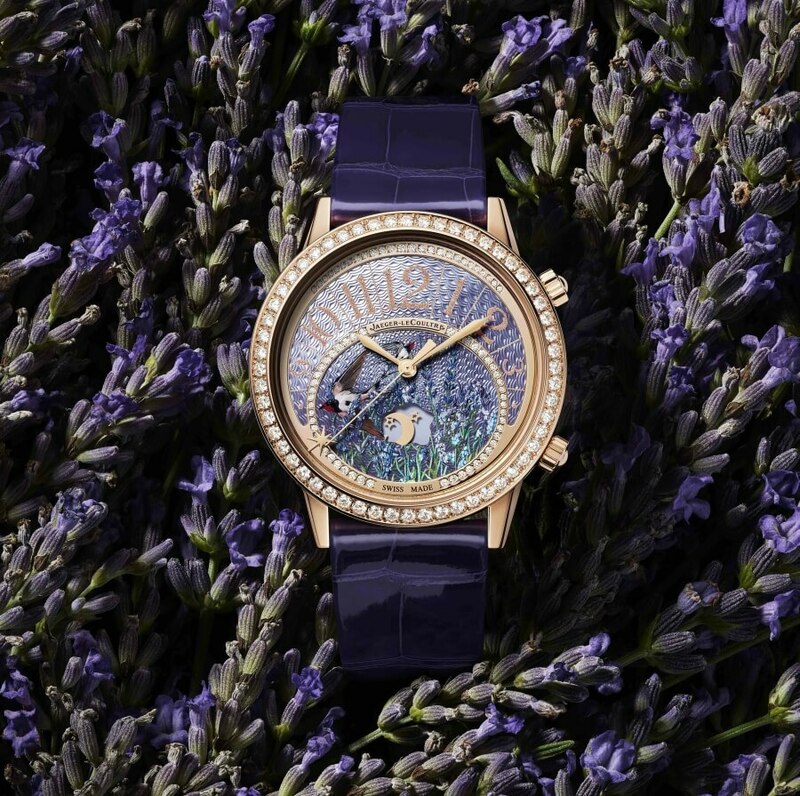 The last model of the limited editions, the Rendez-Vous Sonatina "Amour", depicts the enduring bliss of love. Above a patch of peonies, two magpies fly alongside one another, recreated in graduated shades of green shifting from turquoise to sea-green. Symbols of happiness, these birds appear to be delighting in unison at their journey together. The peonies, often associated with wealth and honour, also embody this romance, and are considered to bring good luck and promise a happy marriage. The cleverly created blend of harmonious greens across the dial gives this extremely poetic model a great softness. These marvellously delicate latest creations reveal the virtuosity of the Jaeger-LeCoultre artisans and their mastery of the art and techniques of Metiers Rares "Rare Handcrafts". They are sure to serve as a reminder of the power of love to every woman who, as she wears a Rendez-Vous watch, takes a starring role in her life, her emotions enhanced by the beautiful jewel adorning her wrist.